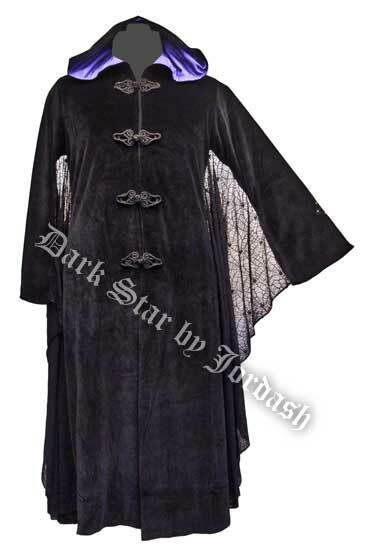 Dark Star Black and Purple Hooded Velvet Coat w Spiderweb Bat Wings [DS/JK/7197P] - $113.99 : Mystic Crypt, the most unique, hard to find items at ghoulishly great prices! Dark Star Black and Purple Hooded Velvet Coat with Spiderweb Bat Wings. Very elegant Gothic Heavy Velvet Coat. Made of black velvet, and Purple Satin hood with cobweb lace batwings! PVC Cross patch on sleeves and center of the back. There are 4 thick black frog fasteners on the coat cape. This is made as free size, but with fit the following. * If you unbutton the frog fastener around the bust this can accommodate another few inches in the bust area. 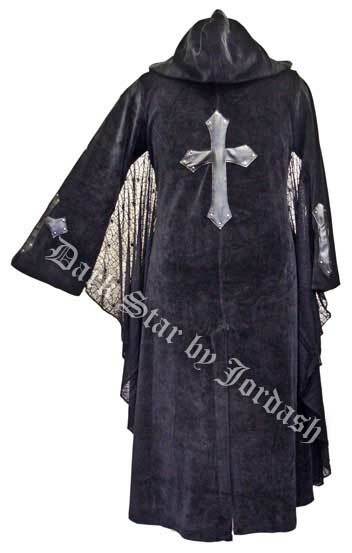 Find more Plus Size Gothic Clothing, Gothic Clothing, Gothic Dresses and more at Mystic Crypt!